Steal the Limelight - The tagline of this month's Fab Bag. Fab Bag always ensures to send some of the best makeup and beauty products every month. October is filled with weddings and here comes a reason to pickup some of the best beauty and makeup products. October is also a month of festivals like Diwali and Navrathri. The festive mood doesn't stop just with this month. Christmas, New year, Pongal and a lot more festivals are lined up on our way. SUGAR NEVER SAY DRY CREME LIPSTICK - 05 BERRY MAGUIRE (DEEP BERRY RED) - Rs.499 for 3.5 g.
Kronokare City Detox Face Wash - Rs.150 for 30 ml bottle. Yuana Premium Hair Oil - Rs.337 for 50 ml. Price: Rs.499 for 3.5 g.
If you want a lipstick that can provide baby-soft finish and a texture that is just right in line between glossy and matte look, just choose Sugar Never Say Dry Creme Lipstick without second thought. The lipstick is free from mineral oils, lanoline and parabens. The lipstick spreads evenly on the lips effortlessly leaving a feather-light texture that looks awesome on your lips. It gives you rich coverage. I am sure this is a lipstick you should try if you are looking for everyday use. Price: Rs.250 for 60 gram. Kronokare is enriched with extracts of plants and flowers. It cleanses the skin effectively respecting your epidermis. Every time you use this, it will give you smooth and soft. The face toner is naturally made of pure distilled flower water, lavendar with the repairing property of Neroli and Ylang Ylang. Your skin texture gets instantly supple, the pores shrink, and the completion is illuminated. You simply glow. Yuana hair oil is a perfect blend of coconut oil, castor oil, sesame oil, almond oil, olive oil, mustard oil and sunflower oil. It is enriched with right ingredients to help in a lot of hair issues like hair fall. Regular use of hair oil helps in boosting hair growth and volume. It helps in improving hair texture too. The hair oil comes with a non-messy pump dispenser and the bottle is travel friendly. It can also be used for hair grooming. The oil is free from silicone, paraben, sulphate and harsh chemicals. When you can get a range of premium products just for Rs.599, there should not be any second thought to grab the bag. 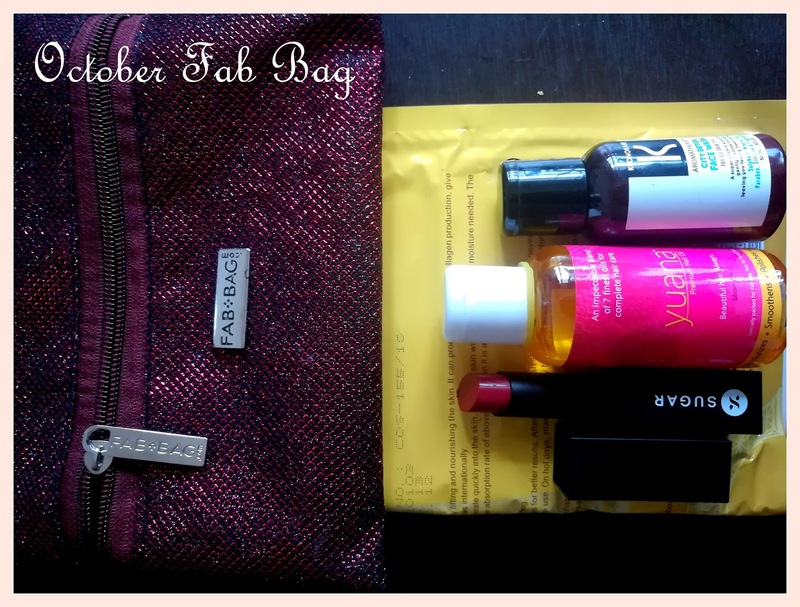 What I like the most in this month's fab bag is the Gold facial mask. Go and grab the Fab Bag at www.fabbag.com for just Rs.599.